We left King Edwards castles and headed north through a short section of England and then into Scotland. 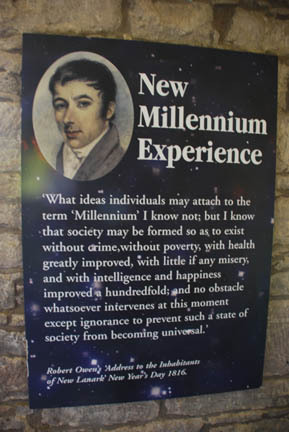 Our first destination was the 1800's mill town of New Lanark. The close buildings are housing, the center one is administration and the far ones are the mills. There used to be four 7-storey mills but one burned down in the late 1800's. This town was built in the early 1800's as a cotton mill and its workers housing, all as a unit, by Robert Owen. He was a progressive thinker and supplied his workers with decent housing, education for the children, a store with reasonable prices and good quality products and health care. This was well beyond the norm for the day. It was essentially a commune. 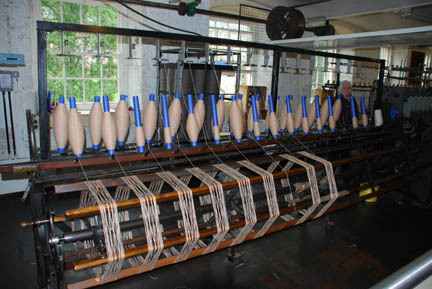 The mill, at its height employed over a 1,000 workers. Today it still has a couple machines working as demonstrations. 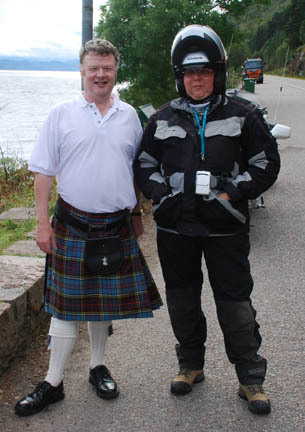 From their we headed up the west coast of Scotland and into the Highlands. These are immense rock hills covered with grass and heather. The sides had waterfalls and rock outcroppings. The valley floor had lakes, streams and sheep farms. It was all very scenic, or at least the bottom half was, it was a day of low clouds and rain. I wish we had been able to see the tops of the Highlands. 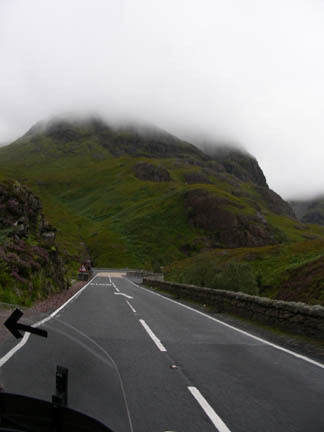 We followed a very narrow road through the hills, under the clouds, along the lakes and into the heart of the Highlands. That night we camped near a town called Fort Williams. And it rained all night long. The next morning we got up and sat in our chairs inside the tent. We watched it rain and rain, sometimes harder than other times, but always raining. 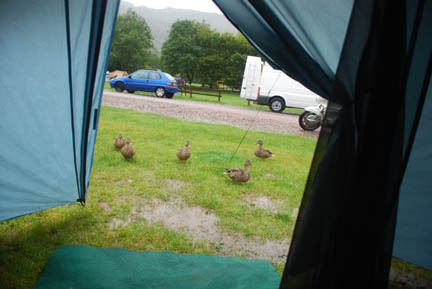 The puddle in front of our tent door got bigger and bigger. 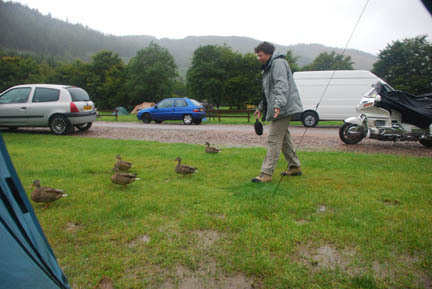 Finally some ducks came over and started feeding in the puddle!!! Kathy ran them off. We had to leave the campground by noon or pay for another night. We were waiting to see if the rain was going to keep falling or not. About 11:00 there was a short break without rain, and then at 11:30 another, then a ray of sun at 11:40. We decided to leave and got out of there at 12:10. We had a couple more showers that afternoon, and still had the low clouds, but it was much better then the day before. Next stop, Loch Ness. And no, Nessie did not put in an appearance for us. Loch Ness (and a couple of other lochs) are in a geological fault line like the San Andreas fault. The surface of the loch is less than 100 feet above sea level. But the deepest part is over 700 feet deep. 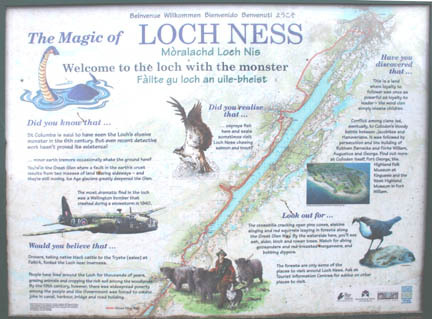 One of the earliest "sightings" of Nessie was back in the sixth century by St. Columba. 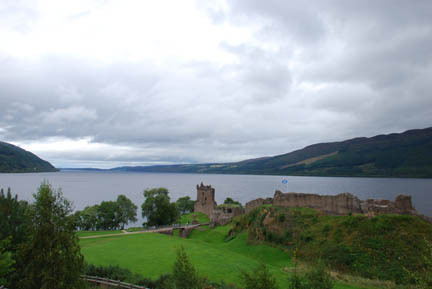 About halfway along the north side is the ruins of Urquhart Castle, right on the shore of Loch Ness. 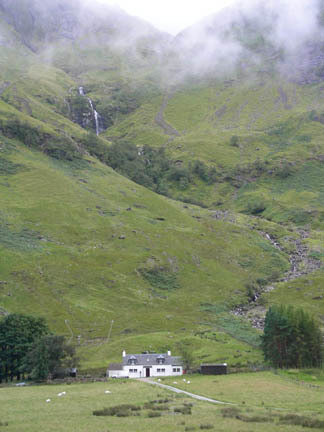 It sits on a small peninsula and has a fantastic view up and down the loch. 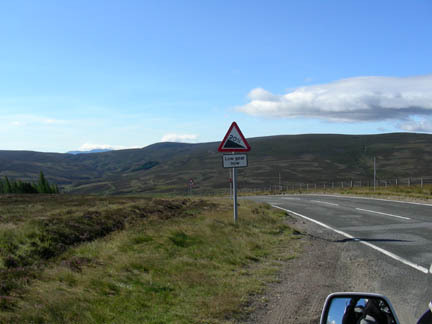 We drove down the road alongside the loch and stopped to read the informational signs when a local came over and was looking at the bike. We talked and he told us some more information than was on the sign, but the interesting thing was he was the first person we had seen that wore a kilt as daily dress. We spent the night in a campground in Inverness. This is as far north as we will go. It is farther north than we have ever been before. It is about 250 mile north of the city of Prince George in British Columbia, Canada (our previous northern high point). From here we follow the "Whisky Trail" It is sort of like wine touring in the Yakima Valley. 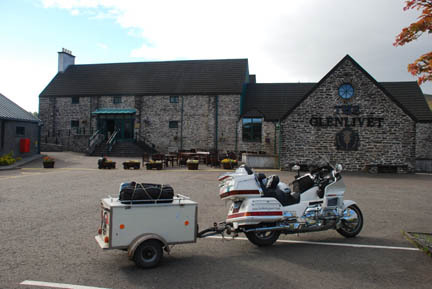 There are distilleries, large and small, scattered all over this part of Scotland. (You will notice that the Scotts don't have an "e" in their spelling of whisky, it's the Irish and the Americans that spell it with an "e".) We went to four distilleries in two days. At the first we took the tour and saw all the details. At the second we visited the showroom and tasted one of theirs. At the third we just visited the showroom. But at the fourth we went into the bar and had a sample tray of four different styles of whisky. And the bartender described each to us and what we should look for in each one's taste. It was very educational. The tastes were small (like wine tastes), not full sized drinks. Along the way we stopped at a working cooperage. The Scotch whiskey is aged in casks (barrels) from the sherry wineries in Spain and from the whiskey distillers in America. 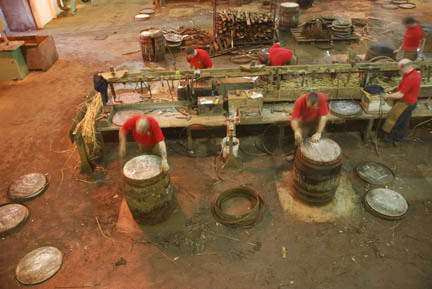 These used casks are rebuilt by the Speyside cooperage. and then over steep heather covered mountains to Edinburgh. It is a 20% slope on the hill. 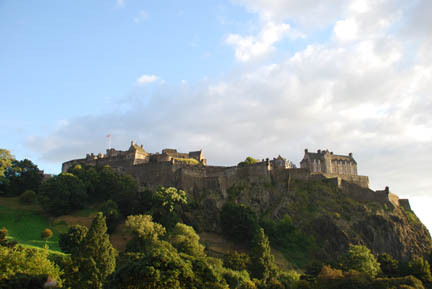 Edinburgh is famous for its castle. The castle sits on top of an old volcanic plug dating from 350 million years ago. The glaciers from the ice ages wore away the soft rock and now all that's left is hard basalt. 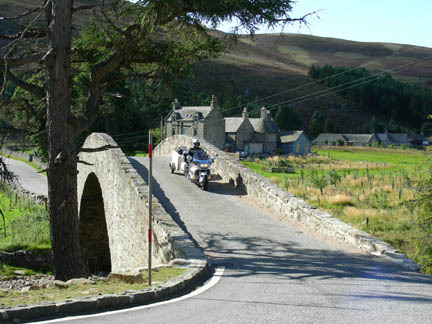 On the east side is a long ramp-like road called the "Royal Mile" and it leads up to the front door of the castle. It is an area of tourist shops, museums and pubs and street performers. After spending several hours looking at the castle, its cannons, museums, and the crown jewels of Scotland (no pictures allowed of the jewels) we walked the "Royal Mile" and had lunch and a pint. Then walked some more and had another pint, and walked some more and had dinner and a pint, all in bright sunshine. The dinner menu had a starter that they called "A Taste of Scotland". It consisted of small portions of Haggis, Neeps and Tatties. The Haggis is famous for what it is, sheep lungs, heart and liver all ground up and cooked with oats and grains in a sheep's stomach. The Neeps is mashed turnips and Tatties are potatoes. It actually was quite good! That evening we took the bus back to the campground and had a dram of whisky. A very pleasant day. 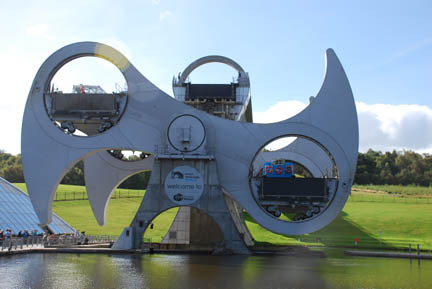 The last stop in Scotland is to see the Falkirk Wheel. 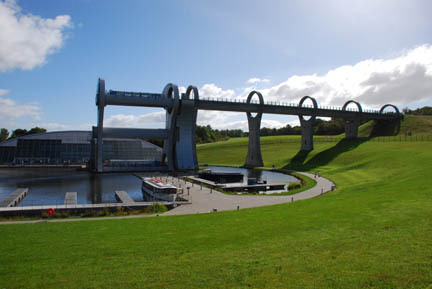 It is a boat lift that replaces about a dozen locks. It rides like a Ferris wheel (we're looking at the hub of the wheel). The two circles are tubs of water each holding a barge boat. At the top center is the end of the upper canal The one on the right is going up and we are looking at its stern with the orange life rings, the one on the left is coming down and we can see the windows of its front. Including loading and unloading it takes about a half hour, the old locks took a half day! This thing has become such a tourist draw that most of its business comes from the tourist boats that go in, up the wheel and then turn around in the turning pool to return to the bottom, where it turns around again and unloads this batch of tourists then loads the next batch of tourists and does it all over again. There are two of them doing this and both are on the wheel for this picture. No, we didn't ride it, we thought 18 British pounds ($36) was a bit too expensive, but a lot of other people were riding it. This is the side view, with one tub each at the top and bottom unloading. The upper turning pool is to the right on the land (just before the canal goes into a tunnel!). From here we return to England. We crossed its southern edge on our way to Ireland and now we're coming back into it from the north.